Which couch model is it? I couldn’t find in your blogs, but I know it is from Article. Hi Jacqueline, it’s the Nova sofa. The diamonds are a dark brown, though at any regular glance it just looks like a generic dark color. Awesome thank you! I will be trying your mud cloth pumpkins this weekend! Can’t wait! where did you purchase the couch? Im absolutely in love with your living space!! Im actually looking for a similar rug. What size did you purchase your rug in? And is it easy to clean? Thank you! It’s 8×10. It needs to be vacuumed very regularly and it sheds. Not the easiest to clean but worth it to me! Hi I am also new to your blog and in love with it as well. How do you think the rug has held up over time. Is it worth it? Hi Krystal! The rug is pretty high maintenance. It sheds a lot at first and requires multiple vacuumings per session to keep it under control. I also use a rug rake to help keep it from getting matted. It still looks great though and the price is the most affordable I’ve found for this Beni Ourain inspired look. Hi, just came across your blog. BEAUTIFUL! I’m planning on buying this same couch but I’m a little sketchy about it considering it’s an online purpose. As this post was dated 7/18… how do you like the couches now? Are the legs pretty sturdy? Hi Virginia! Legs are very sturdy. My one gripe is that the cushions do not hold their shape and get slouchy. They need to be regularly re-fluffed which is another chore on an already long list of chores, but I still love it because it’s so comfortable and exactly the style I was looking for. Hey! Love your blog, did you purchase ‘planetary friends’ with a white border, or did you buy the frame with a border inside? Hi! That’s the way Minted framed it and it’s not a mat, just the border around the print. Not random at all, these details are important! Hi Mary! I did a whole post on it with sources here. Hi Nicole! Thanks for letting me know, looks like it’s no longer available from that source. You can find the chair here. What color paint is that? I love it! It’s Dunn Edwards Swiss Coffee. When we move, I’m taking the paint color with me haha. 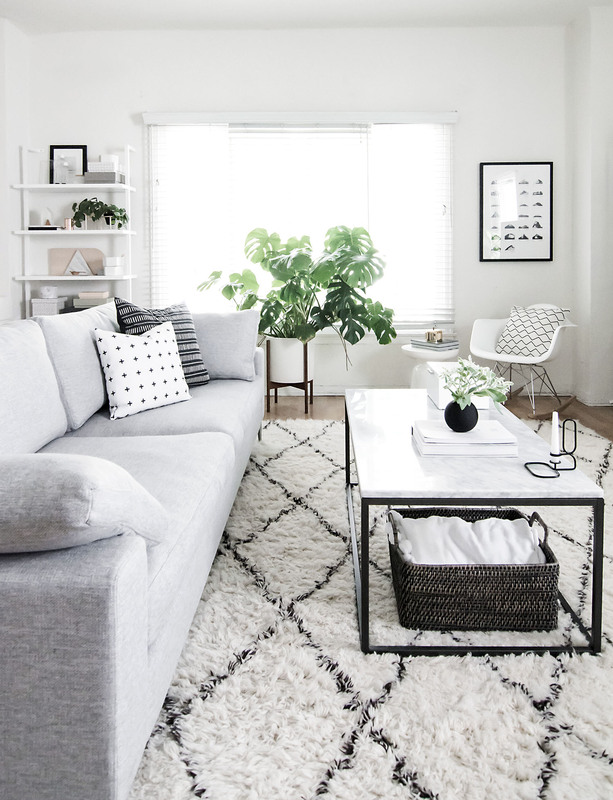 I am currently using an updated image of your living room as my inspiration.. its BEAUTIFUL! However, now you have different white side chairs in the spot of that rocking chair and I’d love to know the source? 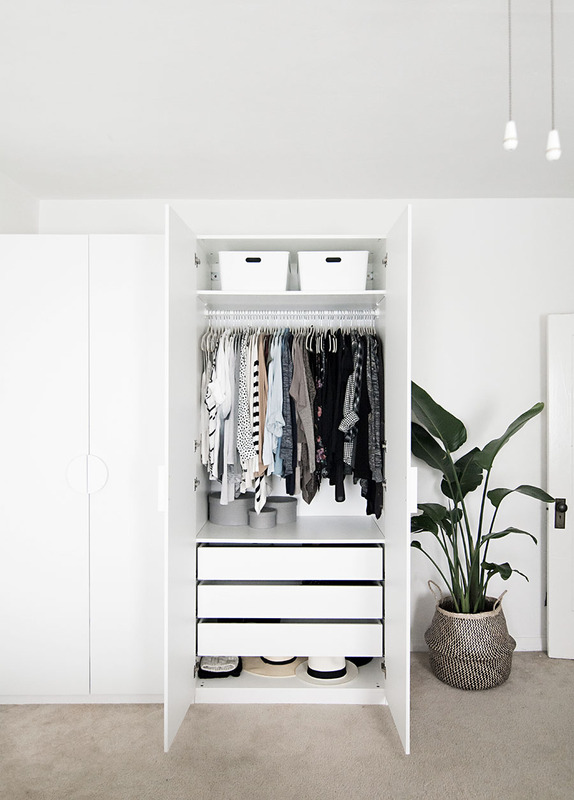 Which white color combination is your Besta unit? I come back to this room over and over! Hi! It’s two of the BESTA frames side by side, and the doors and inside shelves are purchased separately. It’s meant to be customizable so you can add drawers or other features you want but I just did doors with shelves inside. It’s easiest to go to the store if you can and have someone show you options and help find all the pieces. hi Amy just found your lovely living/sitting area on pinterest , lm glad l did and also some of the products you listed can be shipped to Australia and we have ikea here as well.My question is what would you recomed me for a tv cabinet colour, l have black sofa,black table what colour should l get for the tv unit, l really like the white but worried that it might end up looking weird as it will be the only white.. or maybe if l have a whitish/ivory rug do you think it will be ok with the white tv cabinet ? Hi Lee! 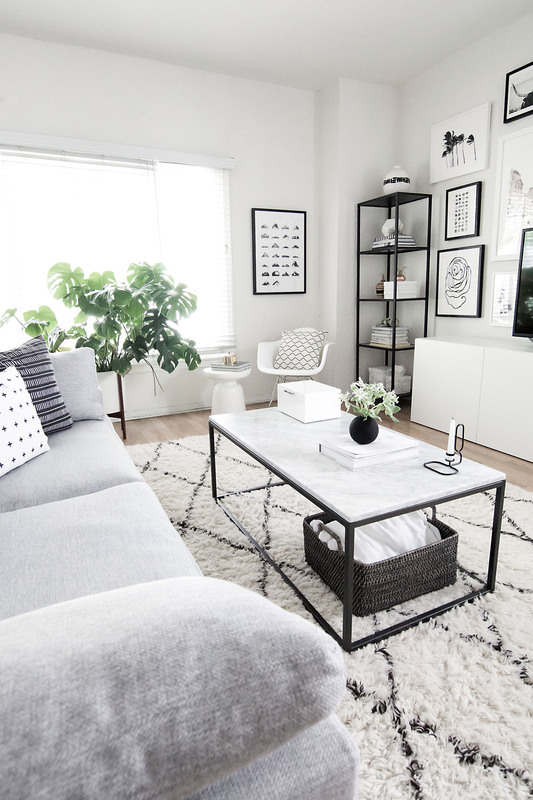 I think a white media cabinet and white rug would look great with your black table and sofa. 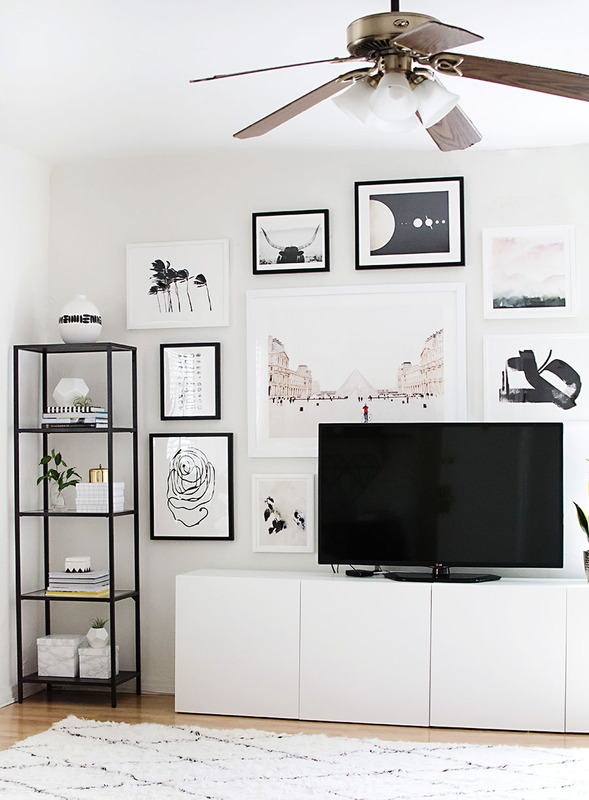 I’m very partial to black and white :) If you want to warm things up, maybe consider a natural wood for the media cabinet. hi!! 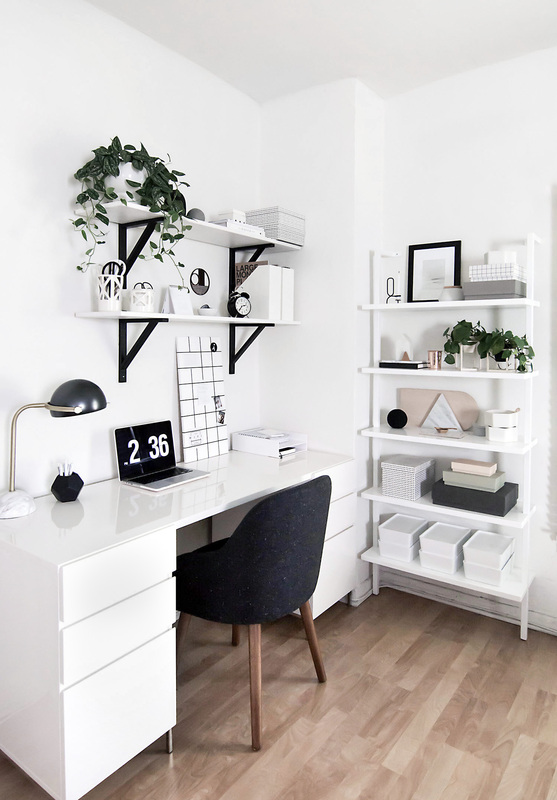 what color combination are your IKEA BESTA frames?